There have been lots of provocative headlines lately about Azure’s growth and earnings versus that of AWS. Revenue is one thing, but where the rubber meets the road is: Does it bring the goods necessary for cloud success for your organization? Consider reframing the question from “Is Azure better than AWS?” to “Is Azure better for you than AWS?” Any IT problem can have a number of solutions, and the company making the most money won’t necessarily be the best for your specific needs. Microsoft has been the enterprise’s gold standard for decades now. Windows Server, Office, Exchange, SQL, and Dynamics all have been around the block and big companies have built the core of their business processes around these products. Imagine asking any enterprise to migrate their thousands (or tens or hundreds of thousands) of employees to a different product. You’re facing retraining costs, converting TBs of data, downtime during the conversion, plus consulting labor. The payoff had better be worth it, but what manager or exec wants to risk such a project going south? This “enterprise entrenchment” mentality plays right into Azure’s favor. Want the power and reliability of cloud, but can’t afford to leave your Microsoft stack? All that on-premise data can go up to Azure, no retraining, no conversions, little downtime, and little labor. Microsoft’s sales team is well aware of this. Any enterprise that has established relationships and software agreements with Microsoft, becomes an easy cross-sell in regard to Azure. With the safety of staying in the Microsoft ecosystem, there’s still fear of change and transition. Microsoft’s answer: the Hybrid cloud. Basically, some resources stay in your data center, some go up to Azure. That can look like a slow, safe migration of users from the on-prem instance of an app up to the cloud version. Or a warm standby of data in the cloud, in case of a data center outage. Or a proof of concept to management of how stable and awesome Azure actually can be. However you use it, Microsoft has bespokely built the latest versions of its core applications to support hybrid cloud, showing their all-in approach to mixing Azure with traditional on-prem software. The latest versions of Windows Server, Exchange, and SQL are all Azure-aware and can deploy resources and data into the cloud right from their consoles (check out this course specifically to learn about hybrid SQL deployments). Microsoft has a unique foot in the door here that AWS and Google Cloud currently have no good answer for. If you’re a Microsoft shop and have in-house-developed business apps running on your Microsoft stack, you’re in luck. 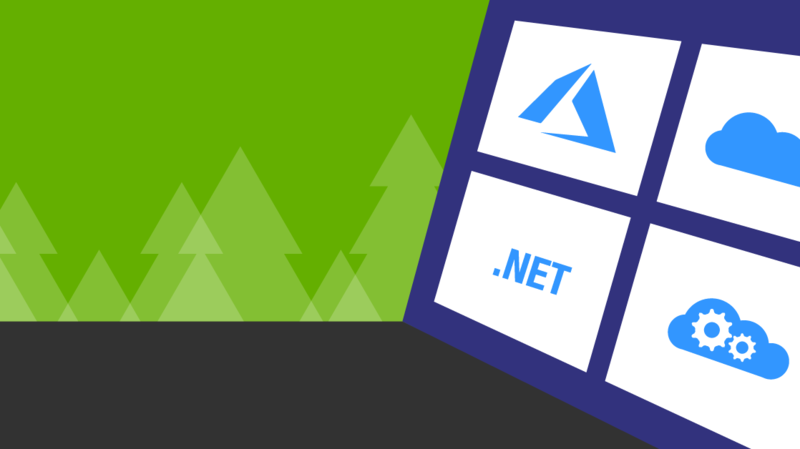 Azure natively runs all your .Net apps, without even having to spin up a virtual server running IIS. Visual Studio will publish apps directly into Azure and run via a feature called Azure Web Apps, a sort of serverless, load-balanced, auto-scaling and auto-patching IIS platform. It’s worth noting that this won’t be an advantage for all companies. Maybe you’re more of a Node.js-coding, ping-pong playing, IPA-drinking, open source evangelizing startup. AWS is much more friendly to open source, but for Microsoft shops, Azure is built for you. If we take a minute to expand our view of cloud offerings from Azure to Microsoft’s entire cloud catalog, their array of business apps far and away crush AWS. We’ve mentioned Exchange, SQL, and Dynamics, but with others like Office Online, SharePoint, and OneDrive, Azure is the clear victor in SaaS offerings. SaaS isn’t AWS’s business model though, fair enough, and they do offer the PaaS support to run any apps on virtual servers, even “on-prem” Microsoft apps. But then you still have a server to manage, it’s just “up there” instead of down the hallway. That’s the power of SaaS; server uptime, load balancing, and patching is someone else’s problem. Like we promised, Azure may or may not be the best cloud provider, but what’s most important is whether it’s the best cloud provider for you. Those already knee-deep in a Microsoft world probably want to stay there, right where Microsoft wants you of course, so they’ve kept busy minimizing the friction to take your apps and data up to their cloud. If you haven’t yet made the jump, we offer plenty of training to get you up to speed.